Last weekend we did something I wish we'd done a long time ago - because then I'd have done it several times since: We went to Bihai Jinsha. Bihai Jinsha is known as the best quality beach near Shanghai and if you translate the name you get something like "Bluish green sea, Golden sand". The "golden sand" is shipped from the lovely Hainan province (which I like to call China's Bali - check my travel posts to this destination here) and the "Bluish Green sea" is being kept clear with help from a comprehensive filtration system. Besides beaching, this spot offers you a wide range of water and on-land activities, Wakeboarding being the one that caught our attention in such a degree that we finally went on a day-mission here. Taxi/Uber: We went with the easy option and booked an Uber from Shanghai's French Concession. The mission took us 55 minutes and costed us RMB 210 + RMB 20 in road toll. We taxied home and cost was approximately the same. With 4 people that's RMB 115 / per person roundtrip which is very reasonable. 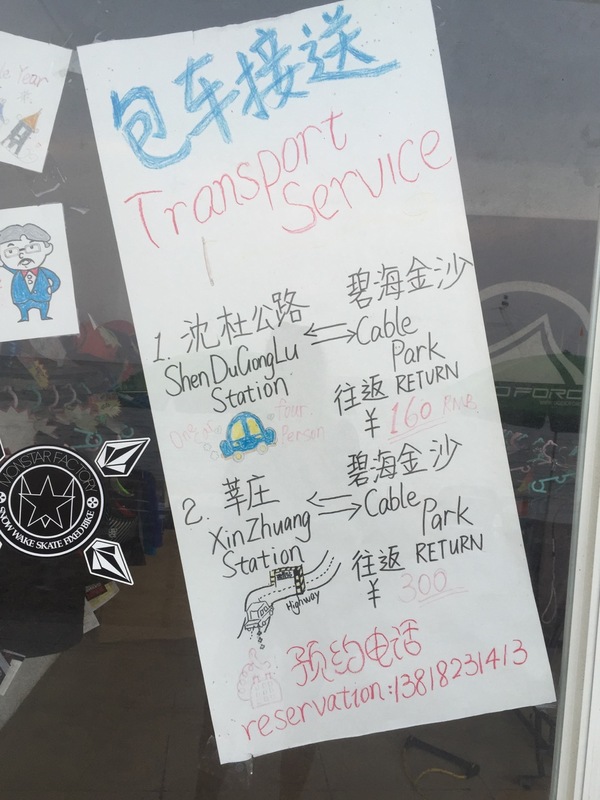 Subway/Train/Pick up: Apparently you can safe some kuais if you go with public transport some of the way and order a pick up directly from Bihai Jinsha. Book through 138 1823 1413 and get updated details. You know when you're getting close to Bihai Jinsha as the air gets fresher and the landscape gets greener. Well just a bit, it's still Shanghai and new empty concrete constructions reveals that someone has big ambitions with this "beach destination" just out of Shanghai. Also, traditional fruit vendors along the road are replaced with vendors selling swim gear & accessories. Absolutely no need to worry if you left your bikini behind, fashionable swimSUITS are available everywhere! When you arrive at Bihai Jinsha parking lot you jump on an official park-car and for RMB 3/person the driver takes you to the part of the park you wish to visit (have translations or photos ready). Now if you just wish to visit the beach you can enter the more public part of Jinsha Bihai: For RMB 30 you can join the other 10.000 happy swimmers (oh wait most Chinese people don't swim) and try to find a spot for your towel. South Europe's most popular beaches during peak season is nothing compared to this. So a kind word of advise, stay away. Instead, get off the park-car at the busy public entrance (photo below), take a right and walk along the water and dragon boats 50 meters until you see the entrance for the Cablepark on your left. Here you pay RMB 150/person for entrance which includes 1 hour of wakeboarding. You can also pay RMB 350/Entrance + 3 hours wake boarding or RMB 550 for an all-day session. My companions (Leon, Jonas & Gitte) went straight to the actual cable track which is a big square track with more speed and optional jumps. The queue on this Sunday was not crazy but there was a wait of about 10 minutes for every turn and if you fail to get up/fall in the getting up part it's back in line! Enjoy the almost VIP beach, bring F&B or indulge in the beach bar (cheese fries and Coronas - so bring your own dose of healthy snacks. Thank God Gitte foresaw this and brought heaps of veggie sticks). Oh green tea is available as well. Totally we spent RMB 380 per person for a day-trip at Bihai Jinsha (Car roundtrip RMB 130, Entrance + 1h wake boarding RMB 150, equipment rental RMB 50, f&b RMB 50).